From 7 September onwards, acclaimed Belgian artist Rinus Van de Velde (°1983, Leuven, lives and works in Antwerp) is presenting new works at Antwerp’s Tim Van Laere Gallery. 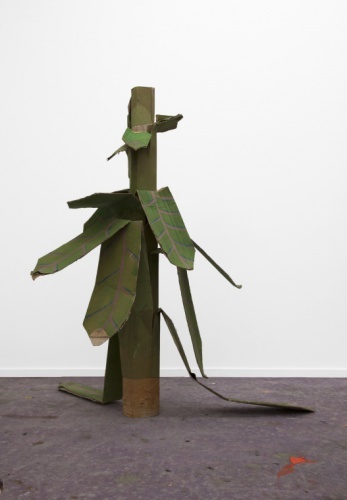 Van de Velde is one of the leading figures of the Belgian contemporary art scene. 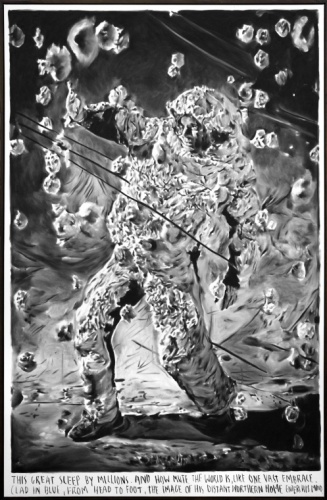 Over the past few years, he has built a strikingly coherent oeuvre, mainly consisting of monumental, narrative charcoal drawings. Although these drawings still play a prominent role in his work, Van de Velde evolves increasingly towards a ‘total artist’, creating a tension between fiction and reality by the use of different media. This exhibition is Van de Velde's fourth solo exhibition in the gallery and his first Belgian exhibition after his successful expo at the S.M.A.K. in 2016. Instead of relying on his previous success, Van de Velde wishes to walk new ways and to experiment with forms, compositions, styles and content. Here, Van de Velde creates his own universe by means of drawings, sculptures, decorative elements and ceramics. He was inspired by ‘Prisoners of the Sun’, a volume of The Adventures of Tintin, the comics series by Belgian cartoonist Hergé. The simple plot and the surrealist compositions of this adventure story serve as the basis for a fragmentary interpretation in which one of the artist's alter egos, the abstract expressionist artist Robert Rino, is being kidnapped by a collector. While the artist is forced to produce work, his two assistants are trying to rescue him. Van de Velde’s work blends reality and fantasy, creating a complex world in which documentation and fiction, reproduction and reconstruction intrinsically tie together. Van de Velde’s loose but virtuoso drawing style is immediately recognizable. The drawings are direct and the subtle modulations of black, white and grey give them a painterly look. But underneath, there are many layers to be discovered: a careful composition and structure, numerous references to the art world, a sharp irony, a visual intelligence and an enormous imagination. In addition, Van de Velde uses in these new works a more independent composition that tends towards the abstract. All of these elements have an impact on the viewer's perception. Van de Velde may suggest a narrative structure, however these works are more autonomous and can be viewed separate from each other. The viewer is thus directly challenged to imagine the larger story of which Van de Velde’s stories seem to be but snapshots. The fragmentary character of the images and texts proves that Van de Velde is willing to take risks with this exhibition. Coincidence and spontaneity are playing a role again.